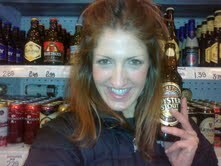 Deveneys of Dundrum: Marston's Oyster Stout. It's a miserable day here in Dundrum. It also doesn't help that I had a relatively late night last night and that I went against my better judgement and regretted to take my car͵ under the guise that I might want a second beer!!... I think we all know that that was a lie. Despite this bearing a word that reminds me of a bad weekend spent in Carlingford with an ex-boyfriend͵ who I developed a distaste for similar to that of Oysters. Let's do it today͵ face those Sunday fears and previously bad long weekend breaks. Marston's Oyster Stout doesn't actually contain Oyster extract. Stout and Oysters were traditionally the poor man's meal. This is a stout that comes branded as the ideal accompaniment. Let's just take them at their word on that though. It pours like a stout͵ looks like a stout and has a head that resembles a stout.However it initially doesn't smell like a stout. It smells like a pale ale͵ loads of floral aromas. Maybe garage carnations? with a mineral element and a slightly roasted tweak. The palate reverts back to it's labelled beer category. This tastes like a stout. A light stout. Roasted malt with some floral flavours͵ nice effervescence and clove on the finish. It has a spiciness that I've never tasted in a stout before and it's very pleasant. Not pleasant enough to visit the fishmonger but good.